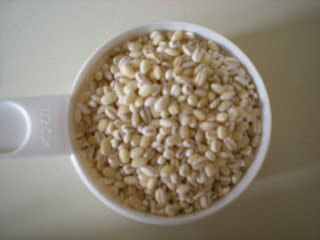 Barley is inexpensive and great for soups and stews. 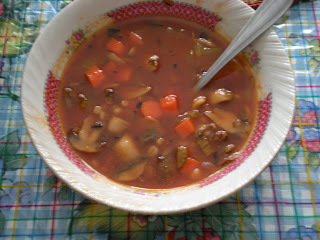 Here is a simple recipe of a very hearty vegetable soup. No meat involved. 1. In a saucepan, heat barley and 4 cups water to boiling over high heat. Reduce heat to low. Cover. Simmer 30 minutes. Drain. 2. Meanwhile, cut mushrooms into thick slices. Cut carrots into cubes. 3. In an oven pot, heat oil over medium-high heat. Add celery and onion. Stir occasionally until golden brown. 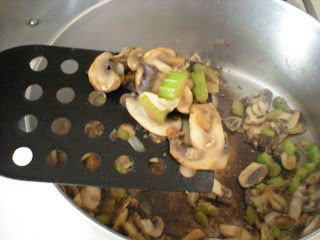 Increase heat to high; add sliced mushrooms. Stir occasionally until all liquid evaporates and mushrooms are lightly browned, 10 minutes. 4. Reduce heat to medium-high, stir in tomato paste and cook for 2 mins. Add broth, carrots, wine, barley and 3 cups water; heat to boiling over high heat. Reduce heat to low; cover and simmer for 20 to 25 minutes, until carrots and barley are tender. 5. Garnish, season and serve hot with croutons.